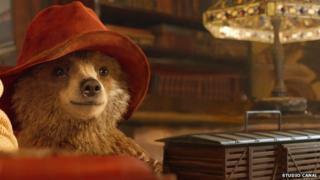 Family adventure Paddington, about the marmalade-loving bear made famous by Michael Bond's series of books, has topped the UK box office chart after its first weekend in cinemas. Paul King's movie about a loveable bear who travels to London took £5.1m between Friday and Sunday. The film stars Hugh Bonneville, Sally Hawkins, Peter Capaldi and Nicole Kidman, as a villainous taxidermist. The Hunger Games: Mockingjay - Part 1 dropped down to second place. The latest instalment in Jennifer Lawrence's fantasy franchise took £4.9m in its second weekend, having scored the biggest UK debut of the year a week ago. The Imitation Game starring Benedict Cumberbatch slipped one place to number three. The second highest new entry was comedy sequel Horrible Bosses 2 at four. The comedy sequel, which sees Jason Bateman, Jason Sudeikis, Charlie Day and Jennifer Aniston reprise their roles from the 2011 original, took £1.26m between Friday and Sunday. Christopher Nolan's Interstellar rounds out the top five in its fourth week on the UK chart. Exactly a year after it was first released in the UK, Frozen re-enters the box office top 10 following the release of a sing-along version. Disney's Oscar-winning animation claims the number seven spot with £177,859, receipts that took its total UK and Ireland box office total to just under £41m. A feature-length documentary about the life of artist David Hockney makes its debut at eight with box office receipts of £161,163. The film, simply titled Hockney, will be shown on the BBC in 2015.